A true color image of Ganymede is acquired by the Galileo spacecraft on June 26, 1996. Credit: NASA/JPL. In radiation astronomy each of the astronomical objects that constitutes a planet emits, reflects, absorbs, transmits, or fluoresces radiation that is observed and analyzed. These observations and their analysis are the essence of planetary astronomy. This is a multicolor image from the Pan-STARRS1 telescope of the free-floating planet PSO J318.5-22, in the constellation of Capricornus. Credit: N. Metcalfe & Pan-STARRS 1 Science Consortium. "PSO J318.5-22 is a confirmed, extrasolar object and candidate planet that does not appear to be orbiting a star. It is approximately 80 light-years away, and belongs to the Beta Pictoris moving group of stars. The object was discovered in 2013 in images taken by the Pan-STARRS PS1 wide-field telescope. The object's age is inferred to be 12 million-years, the same age as the Beta Pictoris group. “We have never before seen an object free-floating in space that looks like this. It has all the characteristics of young planets found around other stars, but it is drifting out there all alone". “Planets found by direct imaging are incredibly hard to study, since they are right next to their much brighter host stars. PSO J318.5-22 is not orbiting a star so it will be much easier for us to study. It is going to provide a wonderful view into the inner workings of gas-giant planets like Jupiter shortly after their birth”. Each of the astronomical objects that constitute planetary science emits, absorbs, reflects, transmits, or fluoresces radiation that is observed and analyzed to produce science about how each is a planet and about the astronomical object itself. The revolution of each planet around its star or stellar cluster should induce periodic changes detectable by the various radiation astronomys. These periodic changes and the science recorded from studying them is the planetary science for that planet. Planetary astronomy should be able to show the periodic changes to the planet as it revolves around its star or stellar cluster. Def. astronomy of a planet affected by periodic changes as it revolves around a star or stellar cluster at or within a light year is called planetary astronomy. "GD-61 ... is a white dwarf [system that lies 170 light-years away] ..., which is surrounded by rubble—the remains of a large asteroid orbiting the star that seems to have been kicked into a close orbit, where the white dwarf’s strong gravity ripped it to shreds. Some of the asteroid’s remains are now scattered over the surface of the star, where they show up as chemical signatures in the light of the white dwarf. ... [Using] the Hubble Space Telescope’s Cosmic Origins Spectrograph ... a huge excess of oxygen [was found]—an amount ... that indicates the asteroid polluting the star’s surface was originally composed of 26 percent water." “This work marks the first detection of water-rich rocks in exoasteroids, and is an important step in developing a comprehensive picture of exoplanetary systems”. “We’ve got the same kind of object which probably delivered Earth’s oceans, and we found this around another star”. “The link of the pollution of a white dwarf to the inventory of water in an earlier planetary system is a very interesting scientific question still under investigation”. "Galactic cosmic rays should have very similar fluxes on Mercury and the Moon." "Solar Cosmic Rays which result in the formation of particle tracks also increase by a factor of up to 10 when compared to the Moon. However, surface temperatures reach 700 K, which can result over millions of years in the annealing of irradiation effects." "During the Mercury flyby of Mariner 10, observations of large fluxes of energetic ... protons (0.53 < E < 1.9 MeV) have been reported" but these may be due to "the pileup of low-energy electrons rather than the presence of protons in the vicinity of Mercury." "The ... solar proton flare on 20 April 1998 at W 90° and S 43° (9:38 UT) was measured by the GOES-9-satellite (Solar Geophysical Data 1998), as well as by other experiments on WIND ... and GEOTAIL. Protons were accelerated up to energies > 110 MeV and are therefore able to hit the surface of Mercury." From the Mariner 10 observations in electron astronomy, it is concluded that "[d]ue to the limited shielding provided by its relatively weak magnetic dipole moment, the surface of Mercury is everywhere subject to bombardment by cosmic rays and solar energetic particles with energies greater than 1 MeV/nucleon." The BESA measurements "show that the planet interacts with the solar wind to form a bow shock and a permanent magnetosphere. ... The magnetosphere of Mercury appears to be similar in shape to that of the earth but much smaller in relation to the size of the planet. The average distance from the center of Mercury to the subsolar point of the magnetopause is ∼ 1.4 planetary radii. Electron populations similar to those found in the earth’s magnetotail, within the plasma sheet and adjacent regions, were observed at Mercury; both their spatial location and the electron energy spectra within them bear qualitative and quantitative resemblance to corresponding observations at the earth." This Chandra X-ray Observatory image is the first X-ray image ever made of Venus. Credit: NASA/MPE/K.Dennerl et al. "Now, 205 measurements of Mercury's surface composition, made by the X-ray spectrometer onboard Messenger, reveal how much Mercury's surface differs from those of other planets in the solar system." The first ever X-ray image of Venus is shown at right. The "half crescent is due to the relative orientation of the Sun, Earth and Venus. The X-rays from Venus are produced by fluorescent radiation from oxygen and other atoms in the atmosphere between 120 and 140 kilometers above the surface of the planet. In contrast, the optical light from Venus is caused by the reflection from clouds 50 to 70 kilometers above the surface. Solar X-rays bombard the atmosphere of Venus, knock electrons out of the inner parts of atoms, and excite the atoms to a higher energy level. The atoms almost immediately return to their lower energy state with the emission of a fluorescent X-ray. A similar process involving ultraviolet light produces the visible light from fluorescent lamps." "[U]ltraviolet observations by Mariner 10 provided evidence for the presence of H and He in the atmosphere (~1011 and 1012 atoms cm-2 respectively3". When imaged in the ultraviolet (article top right), Venus appears like a gas dwarf object rather than a rocky object. In the visual astronomy of Venus almost no variation or detail can be seen in the clouds. ... The surface is obscured by a thick blanket of clouds. ... Venus is shrouded by an opaque layer of highly reflective clouds of sulfuric acid, preventing its surface from being seen from space in visible light. ... [It has] thick clouds of sulfur dioxide ... [There are] lower and middle cloud layers. The thick clouds consisting mainly of sulfur dioxide and sulfuric acid droplets. These clouds reflect and scatter about 90% of the sunlight that falls on them back into space, and prevent visual observation of the Venusian surface. The permanent cloud cover means that although Venus is closer than Earth to the Sun, the Venusian surface is not as well lit. "Strong 300 km/h winds at the cloud tops circle the planet about every four to five earth days. Venusian winds move at up to 60 times the speed of the planet's rotation, while Earth's fastest winds are only 10% to 20% rotation speed. "Average cloud-top wind speeds on Venus rose 33 percent between 2006 and 2012, jumping from 186 mph (300 km/h) to 249 mph (400 km/h), observations by Europe's Venus Express orbiter show." "This is an enormous increase in the already high wind speeds known in the atmosphere, ... Such a large variation has never before been observed on Venus, and we do not yet understand why this occurred." The wind speeds are determined "by studying images captured by Venus Express between [50° N and S latitude, and tracking] the movements of tens of thousands of feature in the cloud tops some [70 km] above the planet's surface." "Our analysis of cloud motions at low latitudes in the southern hemisphere showed that over the six years of study the velocity of the winds changed by up 70 km/h over a time scale of 255 Earth days — slightly longer than a year on Venus". "Sometimes clouds took 3.9 days to zip all the way around Venus, for example, while on other occasions the journey required 5.3 days." "Although there is clear evidence that the average global wind speeds have increased, further investigations are needed in order to explain what drives the atmospheric circulation patterns that are responsible, and to explain the changes seen in localized areas on shorter timescales ... The atmospheric super-rotation of Venus is one of the great unexplained mysteries of the solar system ... These results add more mystery to it, as Venus Express continues to surprise us with its ongoing observations of this dynamic, changing planet." "Venus has a super-rotating atmosphere that whips around the planet once every four Earth days; Venus itself takes 243 Earth days to complete one rotation." The color image shown here at right was generated by combining the mosaics taken through the MESSENGER WAC filters that transmit light at wavelengths of 1000 nanometers (infrared), 700 nanometers (far red), and 430 nanometers (violet). Credit: NASA/Johns Hopkins University Applied Physics Laboratory/Carnegie Institution of Washington. "MESSENGER's Wide Angle Camera (WAC), part of the Mercury Dual Imaging System (MDIS), is equipped with 11 narrow-band color filters. As the spacecraft receded from Mercury after making its closest approach on January 14, 2008, the WAC recorded a 3x3 mosaic covering part of the planet not previously seen by spacecraft. The color image shown here was generated by combining the mosaics taken through the WAC filters that transmit light at wavelengths of 1000 nanometers (infrared), 700 nanometers (far red), and 430 nanometers (violet). These three images were placed in the red, green, and blue channels, respectively, to create the visualization presented here. The human eye is sensitive only across the wavelength range from about 400 to 700 nanometers. Creating a false-color image in this way accentuates color differences on Mercury's surface that cannot be seen in black-and-white (single-color) images." "Color differences on Mercury are subtle, but they reveal important information about the nature of the planet's surface material. A number of bright spots with a bluish tinge are visible in this image. These are relatively recent impact craters. Some of the bright craters have bright streaks (called "rays" by planetary scientists) emanating from them. Bright features such as these are caused by the presence of freshly crushed rock material that was excavated and deposited during the highly energetic collision of a meteoroid with Mercury to form an impact crater. The large circular light-colored area in the upper right of the image is the interior of the Caloris basin. Mariner 10 viewed only the eastern (right) portion of this enormous impact basin, under lighting conditions that emphasized shadows and elevation differences rather than brightness and color differences. MESSENGER has revealed that Caloris is filled with smooth plains that are brighter than the surrounding terrain, hinting at a compositional contrast between these geologic units. The interior of Caloris also harbors several unusual dark-rimmed craters, which are visible in this image. The MESSENGER science team is working with the 11-color images in order to gain a better understanding of what minerals are present in these rocks of Mercury's crust." "Venus at times shows [the oxygen] green line emission with an intensity equal to terrestrial values [Slanger et al., 2001]. Furthermore, the intensity is quite variable, as is true for the much stronger O2( a-X) 1.27 μ emission." "In 1999, observations of the Venus nightglow with the Keck I telescope showed that the 5577 Å oxygen green line was a significant feature, comparable in intensity to the terrestrial green line. Subsequent measurements have been carried out at the Apache Point Observatory (APO) and again at Keck I, confirming the presence of the line with substantially varying intensity." "Ground-based studies suggest that the [557.7 nm oxygen green line] emission is correlated with the solar cycle." "[H]igh-resolution spectral measurements of Mercury show emission in sodium D lines (Potter and Morgan 1985a). This suggests a substantial sodium population in Mercury's atmosphere ... possibly due to photo-sputtering of the planetary surface". Venus is imaged at a wavelength of 630 nm (in the red). Credit: NASA. Although shown in black and white, the image on the right was taken at 630 nm in the red. This is a false-color near-infrared image of lower-level clouds on the night side of Venus, obtained by the Near Infrared Mapping Spectrometer aboard the Galileo spacecraft as it approached the planet's night side on February 10, 1990. Credit: NASA/JPL. "The Herzberg II system of O2 has been a known feature of Venus' nightglow since the Venera 9 and 10 orbiters detected its c(0)-X(v″) progression more than 3 decades ago." "Spectroscopic observations of the differential Doppler shift in a CO2 absorption line on Venus show that the upper atmospheric wind near the equator appears to have both a retrograde motion of about -85 ± 10 m s-1 ... and ... a periodically varying component, with an amplitude of about 40 ± 14 m s-1 and a period of 4.3 ± 0.2 days." At right is a false-color near-infrared image of the lower-level clouds on the night side of Venus, obtained by the Near Infrared Mapping Spectrometer aboard the Galileo spacecraft as it approached the planet's night side on February 10, 1990. "Bright slivers of sunlit high clouds are visible above and below the dark, glowing hemisphere. The spacecraft is about 100,000 kilometers (60,000 miles) above the planet. An infrared wavelength of 2.3 microns (about three times the longest wavelength visible to the human eye) was used. The map shows the turbulent, cloudy middle atmosphere some 50-55 kilometers (30- 33 miles) above the surface, 10-16 kilometers or 6-10 miles below the visible cloudtops. The red color represents the radiant heat from the lower atmosphere (about 400 degrees Fahrenheit) shining through the sulfuric acid clouds, which appear as much as 10 times darker than the bright gaps between clouds. This cloud layer is at about -30 degrees Fahrenheit, at a pressure about 1/2 Earth's surface atmospheric pressure. Near the equator, the clouds appear fluffy and blocky; farther north, they are stretched out into East-West filaments by winds estimated at more than 150 mph, while the poles are capped by thick clouds at this altitude." This is a radar image of Mercury's north pole. Credit: NASA. Water ice strongly reflects radar, and observations by the 70 m [Goldstone Deep Space Communications Complex] Goldstone telescope and the [Very Large Array] VLA in the early 1990s revealed that there are patches of very high radar reflection near the poles. While ice is not the only possible cause of these reflective regions, astronomers believe it is the most likely. 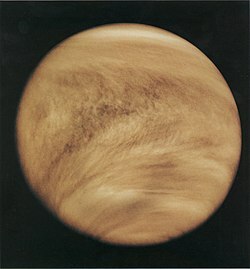 The first un-ambiguous detection of Venus was made by the Jet Propulsion Laboratory (JPL) on 10 March 1961. A correct measurement of the AU soon followed. The image shows Venus Express data with an artist's impression of the tear-drop shaped ionosphere. Credit: ESA/Wei et al. (2012). "During a rare period of very low density solar outflow, the ionosphere of Venus was observed to become elongated downstream, rather like a long-tailed comet. ... Under normal conditions, the solar wind has a density of 5 - 10 particles per cubic cm at Earth's orbit, but occasionally the solar wind almost disappears, as happened in May 1999. ... A rare opportunity to examine what happens when a tenuous solar wind arrives at Venus came 3 - 4 August 2010, following a series of large coronal mass ejections on the Sun. NASA's STEREO-B spacecraft, orbiting downstream from Venus, observed that the solar wind density at Earth's orbit dropped to the remarkably low figure of 0.1 particles per cubic cm and persisted at this value for an entire day." "The observations show that the night side ionosphere moved outward to at least 15 000 km from Venus' centre over a period of only a few hours," said Markus Fraenz, also from the Max Planck Institute for Solar System Research, who was the team leader and a co-author of the paper. "It may possibly have extended for millions of kilometres, like an enormous tail." "Although we cannot determine the full length of the night-side ionosphere, since the orbit of Venus Express provides limited coverage, our results suggest that Venus' ionosphere resembled the teardrop-shaped ionosphere found around comets, rather than the more symmetrical, spherical shape which usually exists." "The side of Venus' ionosphere that faces away from the sun can billow outward like the tail of a comet, while the side facing the star remains tightly compacted, researchers said. ... "As this significantly reduced solar wind hit Venus, Venus Express saw the planet’s ionosphere balloon outwards on the planet’s ‘downwind’ nightside, much like the shape of the ion tail seen streaming from a comet under similar conditions," ESA officials said in a statement today (Jan. 29). It only takes 30 to 60 minutes for the planet's comet-like tail to form after the solar wind dies down. Researchers observed the ionosphere stretch to at least 7,521 miles (12,104 kilometers) from the planet, said Yong Wei, a scientist at the Max Planck Institute in Katlenburg, Germany who worked on this research." Because of the lack of a planetary magnetic field, the free hydrogen has been swept into interplanetary space by the solar wind. "The clouds of Venus are capable of producing lightning much like the clouds on Earth. The existence of lightning had been controversial since the first suspected bursts were detected by the Soviet Venera probes. In 2006–07 Venus Express clearly detected whistler mode waves, the signatures of lightning. Their intermittent appearance indicates a pattern associated with weather activity. The lightning rate is at least half of that on Earth. In 2007 the Venus Express probe discovered that a huge double atmospheric vortex exists at the south pole of the planet. Another discovery made by the Venus Express probe in 2011 is that an ozone layer exists high in the atmosphere of Venus. Venus has an extremely dense atmosphere, which consists mainly of carbon dioxide and a small amount of nitrogen. The atmospheric mass is 93 times that of Earth's atmosphere, while the pressure at the planet's surface is about 92 times that at Earth's surface—a pressure equivalent to that at a depth of nearly 1 kilometer under Earth's oceans. The density at the surface is 65 kg/m³ (6.5% that of water). Mercury is shown in real color. Credit: . Orbit of Mercury is in Polar view, generated by a computer program. Credit: Eurocommuter. Animation of Mercury's and Earth's revolution around the Sun. Credit: Lookang, Todd K. Timberlake and Francisco Esquembre. Diagram shows how Mercury's orbital period and rotational period are locked in a 3:2 resonance. Credit: Worldtraveller and Tos. On the right is a computer program result for the orbit of Mercury. View is from above the ecliptic (North Pole). Mercury is in yellow. A circular orbit with the same semi-major axis is in grey for reference. The orbit is plotted in brighter colours above the ecliptic and darker below. Major axis is drawn showing perihelion (q) and aphelion (Q). Positions show every 5 days before and after the perihelion on May 20, 2006. For illustration the size of the sphere is inversely proportional to the distance from the Sun. The Sun is in the center. Yellow segment points toward the vernal point. Data for the plot is from the Jet Propulsion Laboratory. The second image on the right down from the top is an animation of the revolutions of Mercury, Venus and Earth around the Sun. Mercury takes 88 days to complete an orbit, thus the animation shows it revolving around the Sun approximately 4.14 times (yellow trail) compared to Earth's 365 days (blue trail). The third lower diagram on the right shows how Mercury's orbital period and rotational period are locked in a 3:2 resonance. Venus orbits the Sun at an average distance of about 108 million kilometres (about 0.7 AU) and completes an orbit every 224.65 days. Credit: . The phases of Venus and evolution of its apparent diameter. Credit: . Ultraviolet view of Venus is by the Hubble telescope, in false colour. Credit: NASA. Venus is the second planet from the Sun and orbits it approximately 1.6 times (yellow trail) per Earth orbit (blue trail). Every 5 Earth years correspond to 8 Venus years. 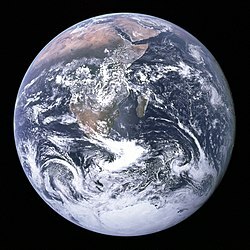 The Blue Marble: Earth is seen from Apollo 17. Credit: NASA. This graph shows the relationship of the atmosphere and ionosphere to electron density. Credit: Bhamer, updated to SVG by tiZom. Def. the "lower levels of the atmosphere extending from [a solid or liquid] surface up to the tropopause ... characterized by convective air movements and a large vertical temperature change" is called a troposphere. Def. the "zone of transition between the troposphere and the stratosphere" is called a tropopause. Def. the "region ... where temperature increases along with the altitude ... [extending] from the tropopause ... to ... the mesosphere" is called a stratosphere. Def. the region where temperature decreases with increasing height is called a mesosphere. Def. the upper boundary of the mesosphere, which can be the coldest naturally occurring place [in the atmosphere of an astronomical object] is called a mesopause. Def. a layer within which ultraviolet radiation (UV) causes ionization ... residual atmospheric gases sort into strata according to molecular mass ... temperatures increase with altitude ... [r]adiation causes ... this layer to become electrically charged is called a thermosphere. Mars is about 143000000 km from the Sun; its orbital period is 687 (Earth) days, depicted in red. Earth's orbit is in blue. Credit: . Thirty orbits of Earth around the Sun correspond to sixteen orbits of Mars around it. This shows the relative location of the orbit of Ceres. Credit: WilyD. The animation shows the relative location of the orbit of Ceres. Jupiter (red) completes one orbit of the Sun (center) for every 11.86 orbits of the Earth (blue). Credit: . Jupiter with the Galilean moons is seen from Earth. Credit: . At the point in Jupiter system, shown on the left, Europa appears closer to Jupiter than does Io. With an average orbital speed of 9.69 km/s, it takes Saturn 10,759 Earth days (or about 29½ years), to finish one revolution around the Sun. Credit: Lookang. The average distance between Saturn and the Sun is over 1,400,000,000 km (9 AU). Uranus is imaged with rings and moons. Credit: ESO. Uranus revolves around the Sun once every 84 Earth years. Credit: Lookang. "A near-infrared view [in the K band, 2.2 µm, is on the lower right] of the giant planet Uranus with rings and some of its moons, obtained on November 19, 2002, with the ISAAC multi-mode instrument on the 8.2-m VLT ANTU telescope at the ESO Paranal Observatory (Chile). The moons are identified; the unidentified, round object to the left is a background star. The image scale in indicated by the bar." Its average distance from the Sun is roughly 3 billion km (about 20 AU). This diagram provided by NASA shows the orbits of several moons located close to the planet Neptune. The new moon, Neptune's tiniest, is designated S/2004 N 1. Credit: NASA. Neptune completes an orbit on average every 164.79 years, subject to a variability of around ±0.1 years. Credit: Lookang. The image at the right shows the Neptune system including Triton. The average distance between Neptune and the Sun is 4.50 billion km (about 30.1 AU). Planets are spheroidal astronomical objects that revolve around one or more stars. ↑ Gemini Observatory (2013-10-07). Gemini Confirms Lonely Planet Floating in Space. ↑ Star-Advertiser Staff (2013-10-09). Astronomers using Hawaii telescopes discover planet without a star. Honolulu Star-Advertiser. ↑ A Strange Lonely Planet Found Without a Star. Science Daily. 9 October 2013. ↑ Institute for Astronomy (2013-10-09). A Strange Lonely Planet Found without a Star. University of Hawaii. ↑ Michael Liu (October 10, 2013). Young planet, six times more massive than Jupiter, found hanging alone without a star. ↑ Niall Deacon (October 10, 2013). Young planet, six times more massive than Jupiter, found hanging alone without a star. ↑ Clara Moskowitz (October 10, 2013). Pulverized Asteroid around Distant Star Was Full of Water. Scientific American, a Division of Nature America, Inc. Retrieved 2013-10-11. ↑ Kevin France (October 10, 2013). Pulverized Asteroid around Distant Star Was Full of Water. Scientific American, a Division of Nature America, Inc. Retrieved 2013-10-11. ↑ Jay Farihi (October 10, 2013). Pulverized Asteroid around Distant Star Was Full of Water. Scientific American, a Division of Nature America, Inc. Retrieved 2013-10-11. ↑ Lisa Kaltenegger (October 10, 2013). Pulverized Asteroid around Distant Star Was Full of Water. Scientific American, a Division of Nature America, Inc. Retrieved 2013-10-11. ↑ Claire Moutou (October 10, 2013). Pulverized Asteroid around Distant Star Was Full of Water. Scientific American, a Division of Nature America, Inc. Retrieved 2013-10-11. ↑ John Debes (October 10, 2013). Pulverized Asteroid around Distant Star Was Full of Water. Scientific American, a Division of Nature America, Inc. Retrieved 2013-10-11. ↑ Brice-Olivier Demory (October 10, 2013). Pulverized Asteroid around Distant Star Was Full of Water. Scientific American, a Division of Nature America, Inc. Retrieved 2013-10-11. ↑ 14.0 14.1 Theodore E. Madey, Robert E. Johnson, Thom M. Orlando (March 2002). "Far-out surface science: radiation-induced surface processes in the solar system". Surface Science 500 (1-3): 838-58. doi:10.1016/S0039-6028(01)01556-4. http://www.physics.rutgers.edu/~madey/Publications/Full_Publications/PDF/madey_SS_2002.pdf. Retrieved 2012-02-09. ↑ 15.0 15.1 Y Langevin (January 1997). "The regolith of Mercury: present knowledge and implications for the Mercury Orbiter mission". Planetary and Space Science 45 (1): 31-7. doi:10.1016/S0032-0633(96)00098-0. http://www.sciencedirect.com/science/article/pii/S0032063396000980. Retrieved 2012-08-23. ↑ 16.0 16.1 T. P. Armstrong, S. M. Krimigis, L. J. Lanzerotti (1975). "A Reinterpretation of the Reported Energetic Particle Fluxes in the Vicinity of Mercury". Journal of Geophysical Research Space Physics 80 (28): 4015-7. doi:10.1029/JA080i028p04015. http://www.agu.org/pubs/crossref/1975/JA080i028p04015.shtml. Retrieved 2012-09-01. ↑ 18.0 18.1 K. W. Ogilvie, J. D. Scudder, V. M. Vasyliunas (1977). "Observations at the Planet Mercury by the Plasma Electron Experiment: Mariner 10". Journal of Geophysical Research 82 (13): 1807-24. doi:10.1029/JA082i013p01807. http://www.agu.org/pubs/crossref/1977/JA082i013p01807.shtml. Retrieved 2012-08-23. ↑ Charles Q. Choi (September 24, 2012). Mercury's Surface Resembles Rare Meteorites. SPACE.com. Retrieved 2012-09-24. ↑ K. Dennerl (November 29, 2001). Venus: Venus in a New Light. Boston, Massachusetts, USA: Harvard University, NASA. Retrieved 2012-11-26. ↑ M. A. McGrath, R. E. Johnson and L. J. Lanzerotti (October 23, 1986). "Sputtering of sodium on the planet Mercury". Nature 323 (6090): 694-6. http://people.virginia.edu/~rej/papers-scan/McGrathetal-Nature86.pdf. Retrieved 2012-09-01. ↑ Krasnopolsky, V. A.; Parshev, V. A.. "Chemical composition of the atmosphere of Venus". Nature 292 (5824): 610–613 1981. doi:10.1038/292610a0. ↑ Vladimir A. Krasnopolsky 2006. "Chemical composition of Venus atmosphere and clouds: Some unsolved problems". Planetary and Space Science 54 (13–14): 1352–1359. doi:10.1016/j.pss.2006.04.019. ↑ W. B., Rossow; A. D., del Genio; T., Eichler. "Cloud-tracked winds from Pioneer Venus OCPP images" (PDF). Journal of the Atmospheric Sciences 47 (17): 2053–2084 1990. doi:10.1175/1520-0469(1990)047<2053:CTWFVO>2.0.CO;2. ISSN 1520-0469. http://journals.ametsoc.org/doi/pdf/10.1175/1520-0469%281990%29047%3C2053%3ACTWFVO%3E2.0.CO%3B2. ↑ 26.0 26.1 26.2 26.3 Mike Wall (June 19, 2013). Mystery on Venus: 'Super-Hurricane' Force Winds Inexplicably Get Stronger. Yahoo! News. Retrieved 2013-06-20. ↑ Igor Khatuntsev (June 19, 2013). Mystery on Venus: 'Super-Hurricane' Force Winds Inexplicably Get Stronger. Yahoo! News. Retrieved 2013-06-20. ↑ Toru Kouyama (June 19, 2013). Mystery on Venus: 'Super-Hurricane' Force Winds Inexplicably Get Stronger. Yahoo! News. Retrieved 2013-06-20. ↑ Håkan Svedhem (June 19, 2013). Mystery on Venus: 'Super-Hurricane' Force Winds Inexplicably Get Stronger. Yahoo! News. Retrieved 2013-06-20. ↑ 31.0 31.1 JHU/APL (January 30, 2008). Mercury Shows Its True Colors. Baltimore, Maryland USA: JHU/APL. Retrieved 2013-04-01. ↑ T. G. Slanger (December 2005). "Practicality of Using Oxygen Atom Emissions to Evaluate the Habitability of Extra-Solar Planets". American Geophysical Union, Fall Meeting 2005. ↑ T. G. Slanger, D. L. Huestis, P. C. Cosby, N. J. Chanover, T. A. Bida, (May 2006). "The Venus nightglow: Ground-based observations and chemical mechanisms". Icarus 182 (1): 1-9. doi:10.1016/j.icarus.2005.12.007. ↑ Tom G. Slanger, Nancy J. Chanover, Brian D. Sharpee, Thomas A. Bida (February 2012). "O/O2 emissions in the Venus nightglow". Icarus 217 (2): 845-8. doi:10.1016/j.icarus.2011.03.031. http://www.sciencedirect.com/science/article/pii/S001910351100128X. Retrieved 2013-01-20. ↑ A. García Muñoz, F. P. Mills, T. G. Slanger, G. Piccioni, P. Drossart (December 2009). "Visible and near-infrared nightglow of molecular oxygen in the atmosphere of Venus". Journal of Geophysical Research: Planets 114 (E12). doi:10.1029/2009JE003447. http://onlinelibrary.wiley.com/doi/10.1029/2009JE003447/abstract. Retrieved 2013-01-16. ↑ W. A. Traub and N. P. Carleton (January 1, 1979). "Retrograde winds on Venus - Possible periodic variations". The Astrophysical Journal 227 (1): 329-33. doi:10.1086/156734. ↑ Sue Lavoie (January 29, 1996). PIA00124: Infrared Image of Low Clouds on Venus. Pasadena, California, USA: NASA/JPL. Retrieved 2013-01-20. ↑ M. A. Slade, B. J. Butler, D. O. Muhleman (1992). "Mercury radar imaging – Evidence for polar ice". Science 258 (5082): 635–640. doi:10.1126/science.258.5082.635. PMID 17748898. ↑ David R. Williams (June 2, 2005). Ice on Mercury. NASA Goddard Space Flight Center. Retrieved 2008-05-23. ↑ Steven J. Ostro (1 October 1993). "Planetary radar astronomy". Reviews of Modern Physics 65: 1235. doi:10.1103/RevModPhys.65.1235. http://journals.aps.org/rmp/abstract/10.1103/RevModPhys.65.1235. Retrieved 2014-07-16. ↑ Miriam Kramer (January 31, 2013). Venus Can Have 'Comet-Like' Atmosphere. Yahoo! News. Retrieved 2013-01-31. ↑ Caught in the wind from the Sun. ESA (Venus Express). 28 November 2007. Retrieved 2008-07-12. ↑ 46.0 46.1 S. T. Russell, T. L. Zhang, M. Delva, W. Magnes, R. J. Strangeway, H. Y. Wei (2007). "Lightning on Venus inferred from whistler-mode waves in the ionosphere". Nature 450 (7170): 661–662. doi:10.1038/nature05930. PMID 18046401. ↑ Hand, Eric (November). "European mission reports from Venus". Nature (450): 633–660. doi:10.1038/news.2007.297. ↑ Staff (28 November 2007). "Venus offers Earth climate clues". Retrieved 2007-11-29. ↑ ESA finds that Venus has an ozone layer too. ESA. 6 October 2011. Retrieved 2011-12-25. ↑ Donald K. Yeomans (11 May 2011). Keplerian Elements for Approximate Positions of the Major Planets. Pasadena, California USA: Jet Propulsion Laboratory. Retrieved 2015-02-03. ↑ troposphere. San Francisco, California: Wikimedia Foundation, Inc. January 13, 2013. Retrieved 2013-02-21. ↑ tropopause,. San Francisco, California: Wikimedia Foundation, Inc. October 15, 2012. Retrieved 2013-02-21. ↑ stratosphere. San Francisco, California: Wikimedia Foundation, Inc. February 10, 2013. Retrieved 2013-02-21. ↑ Eso0237b (20 December 2002). Uranus with rings and moons. Chile: ESO. Retrieved 2015-04-09. This page was last edited on 2 March 2019, at 15:52.